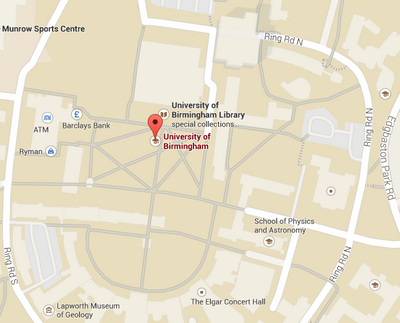 The conference will be held on the Edgbaston Campus at the University of Birmingham in the West Midlands. The lectures will be held in the Avon Room located in University Centre. To book, please go to http://www.venuebirmingham.com/bedandbreakfast/ and enter the promotional code 'ISSC-20' when making your booking. The accommodation deadline is 16th February 2015.